Dun Laoghaire is a town located on the East coast of Ireland, about 11 kilometers south of Dublin. Its picturesque view looks like it just jumped off of a postcard. The town lies in a bay, surrounded by mountains and a beautiful country. It is often called the gateway to Ireland. We could say that that name has some truth to it â€“ the islandâ€™s invaders, such as the Vikings usually reached the shores at DĂşn Laoghaire. 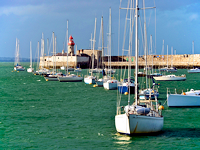 The city was once the seat of the Irish high king, Laoghaire â€“ DĂşn Laoghaire translates as â€�The stronghold of Laoghaireâ€™. The city has a rich historical heritage, beautiful shores in the bay, and thanks to its proximity to the capital, it makes it an excellent starting point to explore Ireland. Of course, there are also a number of excellent programs, if you wish to explore the city and the surrounding area. During a walk in the famous bay, visit the city's Maritime Museum, or if you want to venture out into the bay, rent a cruise boat. After the seaside delights, visit the James Joyce Tower, the Dalkey Castle and the mountains surrounding the town, the Killiney and Dalkey. Discover the most beautiful bay of the Emerald Island. Car Rental in Dublin will help you find the best accommodations and rental vehicles quickly and easily in Ireland.